Now that the weather is warming up across the country, it's time to start shopping. Garage sales are a great place to find deals. Just ask Casey Patty, a self proclaimed garage sale guru. "You gotta get here early," Patty said. "But then you gotta come back because the best deals are at the end of the day." Patty, who uses a tried-and-true system for scoring saleable junk, calls garage sale hunting a game. "I'm a single mother and became a single mother 3 years ago and just trying to do things cheap and fun and found that I could get some great deals." Patty comes equipped with a list, and she knows her product. In one instance she was able to snag a $23 American Girl outfit for just $.50 cents. Patty isn't afraid to buy something she doesn't need if it's a great deal. "You never know when you're going to be able to sell it again," she said. The experts say one of the best ways to get great deals is to go to a neighborhood where there are several sales going on at once, that way the sellers compete for your business and might cut you a deal. And in this down economy, bargain hunters should have more oppportunites to score a deal. In Chicago, there's reportedly been a surge for garage and lawn sale permits. 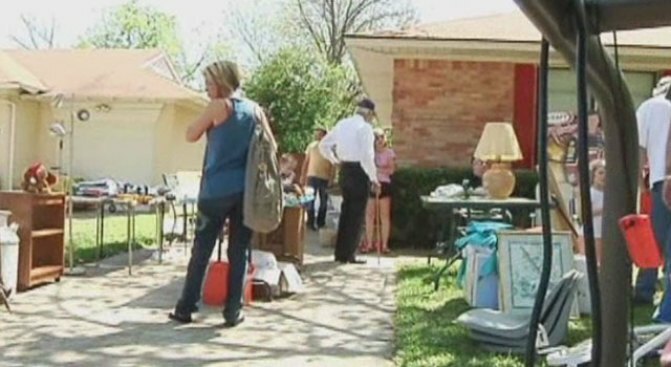 And garage sale postings on Craigslist have gone up 80 percent according to a spokesperson from the popular online site. For buyers: bring cash, arrive early and don't forget to haggle. Don't be afraid to offer a different price, you never know if a seller is desperate to get rid of some merchandise. For sellers: be creative about advertising, careful about pricing and wary about counterfeiters.